Niche Topic: Approaching an unknown piece of sheet music. Topic: Niche Topic: Approaching an unknown piece of sheet music. I'm guessing most here don't read music so I'm assuming this is a niche topic, but maybe it will inspire someone to start to learn to read. As an eharp player, reading standard sheet music is emphasized on day one of the alkire eharp "method", so to help my abilities in unpacking a piece of unknown music, I've bought a pile of old 1930-40's sheet music arranged and published by Eddie Alkire, mostly "hawaiian" arrangements. Here is how I've been approaching it (I'm far from a sight reader). 1. I look at the overall structure: the key, sections, repeats. 2. Next I look at the rhythm. Any tricky parts? If so, I'll sit with a metronome and just hit a single note to the rhythm without worrying about the melody. just tap out the rhythm until it is smooth. 3. Next I look at the melody and I work through the melody measure by measure. 4. Next is to look for the most advantageous place to play each note on the neck. I might find the interval I'm looking for closer, or with better grips. On the eharp, this is a matter of looking at the most economical places to play that require the least amount of bar movement. 5. Next is to try an make it musical . Now that I have the notes down, what is the feeling behind it? I have no one else's interpretation to go by, so I just have my own musical taste and sensibility. Where can I add harmony notes? How about adding some volume pedal. where is the central core of piece of music artistically? Great fun for those of like mind. That's a great approach, IMO. I especially like the second step, separating out the rhythm pattern of the melody and working on it alone. I think that by doing that step carefully for a number of tunes, one would quickly develop a high level of certainty of comprehension of the most common uses of the various rhythmic values. After that, the rhythm component would become easy. For many people, rhythm is a big stumbling block in reading music, and this step would solve it. Once the rhythm of a passage is clearly understood, any time problem in execution of the passage becomes purely a matter of technique, which can usually be addressed through slow practice with a metronome. I think the study of rhythm is one of the most important uses of standard music notation, especially for the player of an instrument such as steel guitar which does not have an extensive written literature. Learning rhythmic phrases is great for improvising, as it helps an improviser learn to conceive of whole phrases at once rather than improvising just on the basis of one note leading to the next. You might like to try a variant of the third step which is to imagine how the melody sounds and to sing it before playing it on an instrument. (It might be necessary to initially play the first note of a tune on an instrument just to get a pitch reference.) For chords you can sing individually each of the notes and imagine how they go together. In my experience, learning to get the sound directly from the dots makes the whole business of reading music much more pleasurable, in comparison to translating from the page directly to the instrument and then finding out how it sounds. The best way I have found to learn this skill is to work through one or more books on sight singing. Of the books I have used, probably the overall best is Music for Sight Singing by Robert Ottman. The new editions of this book can be rather expensive, but earlier editions are available on Amazon, Ebay etc. for reasonable prices. I would not recommend the first or second edition because the book was greatly improved in the third edition, but I think the third or any later edition would be an excellent place to start. Going through that book slowly but steadily over an extended period was one of the best things I ever found to improve my own musicianship. Thanks for the great post John. I'll look up that book! Excellent suggestions. 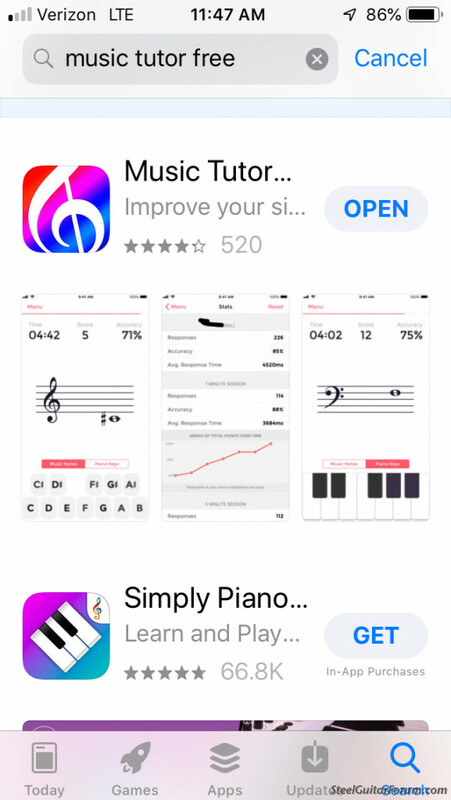 Music Tutor is a free cellphone app I've found very useful. It's for practicing the notes on the staff. When you're waiting for a plane or in line somewhere, you can whip out your phone and have a musical alternative to political news and cat videos. I used to do this a lot with classical guitar music. I have never been a fan or a formal student, so the pieces were not familiar by ear. I followed a “chunking” system. After reading through the piece and figuring out how the A, B, and C parts were arranged, and the repeats, if any, I would work through one part at a time until I had what seemed like a feel for how it was supposed to go. By the time I had played through each part (however hundred many times) it was pretty much committed to memory, and putting them together was a lot easier than trying to play through the whole thing right from the start. This system also works for zeroing in on difficult phrases within the various parts of a tune. In order to not cheat rhythmically, I used a metronome extensively. The previous comments about rhythm are taken to heart. Without a sense of how long notes are supposed to last and the space between them, your song might end up as a very nice pile of notes that don’t mean much to anybody. Sometimes when I have made a suggestion to another musician about what or how to practice, I have found it profitable to turn around and apply the suggestion to myself, in my own practice. In this case, having recommended the use of Robert Ottman's book Music for Sight Singing earlier in this thread, I decided it would be a good time for me to go through the book again. Not surprisingly, I'm finding the book a quite a bit easier than when I went through it the first time, six or seven years ago. The first run-through took me about a year to complete, looking at a small number examples each day, on an almost daily basis, and imagining how they would sound if played on an instrument. This time, I've completed the first quarter of the book in just over a month, and this time I'm finding it possible to pay attention to and imagine not only the pitches and rhythmic values of the notes, but also the given dynamic and phrase markings. Also in the duet examples I am finding it much easier to imagine the sound of two parts at once. I'm now in the section of the book that teaches the alto and tenor clefs, which is a little weird because these don't show up "in real life" very often in the music I play. But even this challenge is going easier this time around. If I could rewrite one thing in my own history of studying music, it might be to have gone through this book in my teens rather than in my 60's. Of course, if I hadn't quit piano lessons around age 6 after the second or third lesson, that could have helped quite a lot too! But this book covers quite a bit of basic music theory, so provides a great foundation for further music study, along with the training of sight reading ability. For me, the key to this has been working on reading music away from my instrument, translating the notation into a mental image of the music rather than fumbling around on the instrument in frustration to find the right notes and then hear the sounds. Of course, learning to find the notes on the instrument has to be accomplished too, but it's easier and more pleasant to do to the extent I already know what they're going to sound like.